Melbourne, Australia’s Elm Street are a band that plays good old fashioned heavy metal and are proud to do so! At first glance of the cover art and logo (and knowing they are on the Massacre label), I thought maybe they were going to be a brutal-sounding thrash band but don’t let that artwork by the legendary Ed Repka fool you! Yes, this band does have some thrash moments (such as the relentless opening number) but they describe themselves as traditional heavy metal and also display a great sense of melody and New Wave of British Heavy Metal/traditional metal influence. The melody aspect is evidenced on the second track “The Devil’s Servants” and it also reminds me of Black Veil Brides. Don’t worry, it’s not metalcore. Another thing that stands out about this band is that they are horror movie fans. I mean, the band’s name is Elm Street and they have songs called “Elm St’s Children” and “Leatherface”. These guys are all about delivering fun, powerful heavy metal — “Barbed Wire Metal”? “Heavy Metal Power”? “Metal Is The Way”? You betcha! There’s lot of good solos and riffs throughout this album and singer Ben Batres has that necessary roughness that wells work with traditional metal. His voice reminds me of Mr. Lordi. I love the gang vocals, too, by the way! The band knows their way around a melody but they are heavy and fast enough that you won’t think they are wimping out. 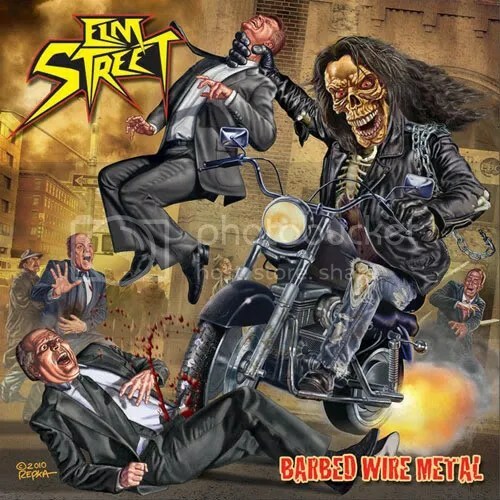 So, if you want some fun and recent heavy metal to bang your head to Elm Street’s Barbed Wire Metal is just what you need! File this under “Albums I Wish I Had Heard In 2011”!